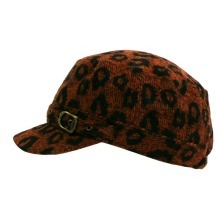 This ultra chic and stylish Leopard spotted newsboy spotted hat features an ultra soft design with a full lining on the inside. There is an elastic band in the back which stretches to allow this hat to have a perfect fit just about every time. An antique golden tone buckle finishes off the front. Hat has a 24 inch circumference. Hat brim is 2 inches wide. Hat crown is 4 inches high.